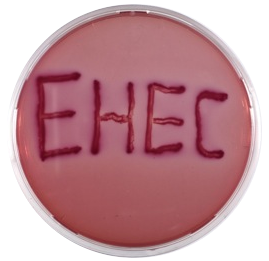 EHEC (Enterohemorrhagic Escherichia coli) are intestinal pathogens characterized by the production of phage-encoded Shiga toxin (also called verotoxin) which explains the alternative abbreviations STEC or VTEC. 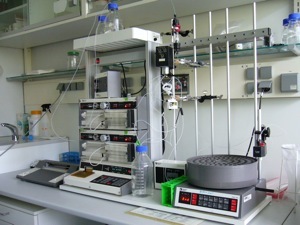 The bacteria may also encode a characteristic adhesin molecule (eae) and/or hemolysin. EHEC infections can occur without any symptoms but in most cases a gastroenteritis is developing within two to ten days, sometimes leading to a severe enterohemorrhagic colitis. A serious complication can be the Hemolytic-uremic syndrome (HUS) where hemolytic anemia, acute kidney failure and low platelet counts are involved. Due to the complexity of the infection, HUS is associated with 5 to 10 % mortality. Most of the infections are caused by foods like animal products (raw meat, milk) or contaminated drinking water. In 2011 a massive EHEC O104:H4 outbreak in northern Germany was caused by bean sprouts and resulted in more than 3,000 infections including 54 deaths.